Visual Astronomy: Help Solve an Astronomical Mystery! Help Solve an Astronomical Mystery! Have you ever wanted to make a contribution to real science? Well, now you can, with the Citizen Sky Project! The Citizen Sky project is an attempt to solve a 175 year-old mystery. 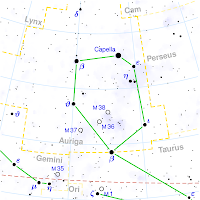 Every 27.1 years, the star Epsilon Aurigae undergoes an eclipse. Astronomers have been studying this star for over 175 years, yet still don't fully understand the nature of its eclipsing object. Citizen Sky has more information on Epsilon Aurigae here. The problem is that the star is so bright that it cannot be observed with most large professional telescopes. So, the task has been assigned to amateur astronomers everywhere to help with observation during Epsilon Aurigae's next eclipse in August 2009! "Citizen Sky welcomes everyone to be a citizen scientist. We will guide you through the process of how to observe epsilon Aurigae, how to send us your observations, and then how to see your results, analyze them, and even publish them in a scientific journal!! No previous experience is required. We hope that this project will involve thousands of people all over the world in real, active scientific research." So join Citizen Sky and make a difference in astronomy! I've already joined, and will be making observations whenever possible! Ik waardeer echt de inspanning die u heeft gemaakt om de kennis te delen. Dit is echt een geweldige dingen om te delen. Bedankt voor het delen. Remarkable advertisement! I enjoy sector start out and even then stop your thinking. Through bless you from this material. At this point satisfy go here Cash Advance As I definitely take pleasure in project, stay in the ideal. Gracias por este artículo. Soy un nuevo blogger, así que esto es muy útil. Es difícil saber cuánto tiempo lleva hacer un blog exitoso. Es fácil desanimarse cuando no ves movimiento, pero esto me da un poco de aliento. Me aseguraré de marcarlo y volver para leer más de su información útil que podría ser útil para mi sitio web. Gracias por la publicacion.